2015 has been a year of smartphones with fingerprint scanners- from budget and midrange to high-end flagships, looks like every brand is now concentrating a lot in this particular criteria.From small brands starting from Coolpad, to middle range flagship makers like OnePlus, everyone is busy in that- I can surely leave the big players out in the market. 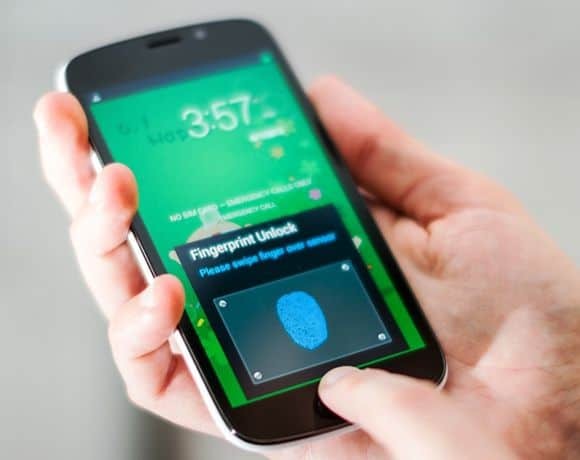 So, today we will look towards the Top 5 Android smartphones with fingerprint scanners which makes these phones super secure and keep the phone under your control, always. Some people might argue over this choice or why it put in in our list of Top 5 Android smartphones with fingerprint scanner, but actually I’m not that fan of the S Series, rather I feel that the Note Series is extremely premium looking and I just crave for the S-pen. one damn solid reason for keeping it one top. The galaxy Note Edge sports a 5.6 inch super AMOLED display with a resolution of 2560 x 1600 pixels. The device is powered by a quad core processor, coupled with 3GB of RAM and 32GB ROM. You can expand the memory upto 128GB using a microSD card. For additional privacy and security, you can use the finger print scanner too. This handset also comes with IR Blaster, which means you can use it to control your TV, AC and other electronic devices. There is a 16MP primary camera with smart OIS and fast auto-focus feature and on the front is a 3.7 MP secondary camera. This is a 3G enabled single SIM device that gets the power from a 3000 mAh battery. The latest flagship from Samsung features a complete defiirenet design philosophy and it just got away with the usual Samsung feel. The S6 Edge sports a 5.1 inch super AMOLED dual edge display with a resolution of 2560 x 1440 pixels. It is powered by an Octa core Exynos processor, coupled with 3GB RAM and 32GB internal memory. The device comes with fingerprint scanner, wireless charging, quick charge and much more. It sports a 16MP rear camera and a 5MP front-facing camera for selfies. However, all these are backed up by a 2600 mAh battery. Most of the lists like this one contain at least a nexus devices if we speak from budget phones to flagships. earlier Nexus phones could not have make it to the list of Top 5 Android smartphones with fingerprint scanner, but this time Nexus 5X definitely deserves to be here. The latest Nexus 5X from LG packs, power, security, performance and beauty in one single package. The Nexus 5X sports a 5.2 inch full HD display device with a resolution of 1920 x 1080 pixels. It is powered by a 1.8 Ghz Qualcomm snapdragon 808 64-bit processor, coupled with 2GB RAM. The device comes in 16GB and 32GB variants, but doesn’t support external memory card. It runs on the latest Android 6.0 Marshmallow out of the box. This single SIM device supports 4G LTE. There is a 12.3MP on the back with dual flash support which takes beautiful snaps and also, there is a front-facing 5MP camera. The handset gets power from a 2700 mAh battery. The so-called flagship killer (really?) is also in this rat race. The OnePlus 2 with rock-solid specs also houses a fingerprint scanner. It sports a 5.5 inch full HD display, protected by the Corning Gorilla Glass. It is powered by an Snapdragon 801 octa-core processor, coupled with 4GB RAM and 64GB ROM. The other features include fingerprint scanner, USB Type-C and 3-way physical alert toggle switch. It also sports a 13MP snapper and there is also a front facing 5MP camera. The device gets the power from a 3300 mAh battery. OnePlus 2 is exclusively available on Amazon India. Some of you might wonder how a Rs. 9,000 worth of phone can get onto the top. But the main thing is that I just don’t look over the fingerprint scanner. There are other factors as well, like scanning time, hardware and design, everything else. Coolpad seems to be doing hard work behind this phone. The Coolpad Note 3 runs Android 5.1 Lollipop out of the box. It has a 5.5-inch HD (720×1280 pixel) display and is powered by a 64-bit octa-core MediaTek MT6753 processor coupled with a huge amount of RAM, that is 3GB. The device has 16GB of storage on board. It sports a 13-megapixel rear autofocus camera with LED flash and alongside a 5-megapixel front-facing camera and both the cameras will come with a CMOS image sensor. This beast is juiced by a 3000mAh battery. So, what’s so special? The main impressve thing about this phone is the fingerprint scanner and pricing. The fingerprint scanner is fast as hell and I just couldn’t believe that a budget phone can have such a good fingerprint scanner. Apart from that, the pricing is also very impressive. At less that rs. 10K price tag, this phone is a mus buy if you just wanna try a good fingerprint scanner on a budget smartphone, don’t worry- I’m sure you will get amazed to see it in action. So, here it was- The Top 5 Android smartphones with fingerprint scanner that we saw in 2015. Hope, we will see some more kickass devices like this in the upcoming year which is just a few days away. Meanwhile, we’re planning something, keep checking our Facebook page for all updates and announcements and invite your friends!! Have a great holiday! !